And that's it from me today on the reaction to Sunday's Premier League action and the pitch invasions by spectators at Arsenal and Birmingham. There is no Premier League game on Monday night but if there are any further developments with those stories later we'll bring those to you. 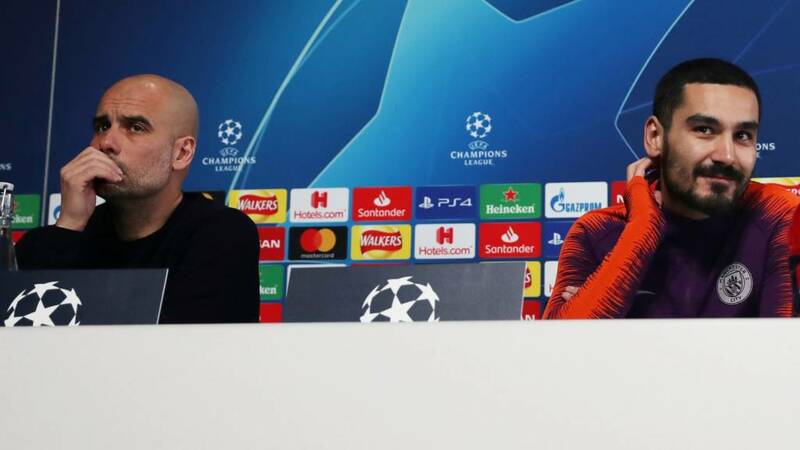 Finally from Pep Guardiola, this story is now live on the Manchester City boss saying his side are "teenagers in the competition" as they prepare for Tuesday night's Champions League second leg against Schalke. Manchester City supporters have a rocky relationship with the Champions League, which generally involves them booing the pre-match anthem. Pep Guardiola seems to have detected a softening in the attitude, although it hasn't been detected by many outside observers if it actually exists. "I think the last time there were less boos," he said. "Now people are starting to enjoy this competition, they are feeling like we can do it together." Given Uefa have just opened an FFP investigation against City, I have a feeling there will be more boos at the Etihad on Tuesday night. PFA chief executive Gordon Taylor is currently giving his reaction to the pitch invasions over the weekend. After seeing Real Madrid and Paris St-Germain suffer surprise exits from the Champions League last week, Manchester City boss Pep Guardiola warned against complacency heading into their second leg against Schalke. "When we see a draw we always say who is going to win and after the first leg everyone thinks they know, but nobody expected PSG or Real Madrid," he said. "There can be a red card, many things can happen. We are quite lucky that we played 10 v 11 for 20 minutes with 2-1 down (in the first leg), we could have been out. We are lucky, we scored and came back. "So we should make an incredible effort in every situation to go through because what happened in the first game can happen again. It doesn't change the second game much, we have to do everything to go through. I am sitting here thinking we still have work to do, that's my feeling." That was an interesting news conference with Manchester City midfielder Ilkay Gundogan. Sat next to his manager, Gundogan opted against side-stepping questions about his future and addressed them full-on. He could easily have said he was committed to the City. Instead, he said: "I am 28 years old now so my next contract will maybe decide where I will be for the end of my career. "Everyone feels different. Maybe someone has an inner feeling in his self to go for a new challenge or to change something. "If you see on my [curriculum] vitae you can read that I am always open-minded for challenges but it is a personal situation. "This is something that is not obvious. Everyone has to make his own decision." His current deal expires in 2020 and City are not keen on letting players get to the end of their contract. Make the purchase of a tickets a 'contract of behaviour' with the club. If fan invades, club gets fined but then can sue the fan responsible for damages due to them breaching the contract. The problem isn't security at football grounds it's with the fan culture. I can't think of another global sport that still allows this tribal mentality to persist. NFL, Cricket, Rugby....why do football fans still need segregating? By modern standards they are still in the Dark ages. The people are the problem and it needs fixing. I don't think there needs to be a complex solution to a simple problem. Why don't clubs not sell tickets for the front 3 rows closest to the pitch? Stewards can identify potential threats earlier and more obviously with clubs minimising lost revenue/outgoing costs. Hendrie - Does someone have to get hurt? Former England and Aston Villa player Lee Hendrie has spoken to BBC West Midlands about Sunday's incident involving Villa captain Jack Grealish. He said: “What can we do to stop this before someone actually does end up getting hurt? Is it going to take that before we actually stand up and start doing something? Chris: No fences or moats, it's not a zoo. Life ban + minimum £1,000 fine plus whatever criminal charges are pressed. Even idiots understand money so hit them in the pocket. Iglethal: The fine for going on a pitch is UP TO £1k. That is a large part of the problem. That's not a deterrent. In Aus it is A$10k. Not up to $10k. It IS $10k. A flat £10k fine for entering the pitch, with jail time for non-payment, that would be a deterrent. Nothing less. On the incidents during Sunday's games, Pep Guardiola added: "The people involved at Birmingham and Arsenal, it can happen here too. "We must work on the culture, be better human beings, that kind of thing." Pep Guardiola has been linked with Juventus but, asked about his future, the Manchester City boss said: "I have two more years and that's all. "Many of them (the stories) are not true but I cannot come and deny everything. I'm going to be here two more years. For the future, I don't know." It was little surprise to see Garth Crooks name Raheem Sterling in his team of the week after the Manchester City forward scored a hat-trick in Saturday's 3-1 win over Watford. This time last week, Manchester City manager Pep Guardiola was anticipating a last eight of the Champions League including Real Madrid and Paris St-Germain. Neither of them made it through. But Guardiola says that doesn't make life easy for Manchester City. "A week ago we didn’t expect PSG would happen or Real Madrid," he said. "Real Madrid have been four times winners in five years, and the last three in a row. That is incredible. They were the favourites in my eyes. "But anyone who thinks it will be easy because they are not there is wrong. The teams in the next round will be quite similar to the level of Real Madrid." Manchester City manager Pep Guardiola on fan incidents: “It is not about my players, but the players in general. Hopefully it cannot happen again. "Maybe the problem is with the society in football. Today there are no walls, it can just happen. "Birmingham is not guilty for anything. It is the person not the club. "We misunderstand where we have to put the focus. The clubs can try everything but you cannot control absolutely everything and the behaviour of the people on the street. It is the guy who did it. He is responsible for it." Joe Taylor: As a season ticket holder at Birmingham I have never been so ashamed of my club as I was yesterday. Inexcusable violence from an idiot. May I say most cheers from where I was sat was for catching the clown who did it. We deserve any punishment handed to us. Manchester City midfielder Ilkay Gundogan has just been asked about the incidents at the weekend, in particular the one involving Jack Grealish. He said: "I was never involved in that situation, other than one person running across the pitch and the security guys got him. "The guy has to get a huge ban, not to be able to visit the stadiums and watch the games. "I feel really sorry for the player. Maybe it is karma that he scored. We all agree this cannot happen in football." Manchester City midfielder Ilkay Gundogan has been talking about his future with the club. Manager Pep Guardiola wants him to stay but Gundogan is stalling over an extension to his current contract, which expires in 2020. Gundogan said: "There is no decision yet, otherwise I would have signed. We are still in talks but there is not much pressure because we are still in all the competitions. "One day there has to be a decision but I am very happy here at the moment." Manchester City are also in action on Tuesday night, against Schalke in the Champions League. Pep Guardiola and Ilkay Gundogan will be doing a news conference shortly to look ahead to the game. They can operate quite well without translation. Some of the journalists, including me, less so. 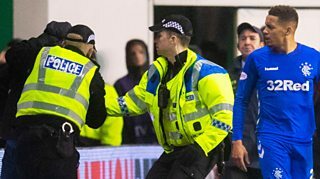 Rangers captain James Tavernier was confronted by a fan during Friday's 1-1 draw with Hibernian. And ahead of Tuesday's Scottish Cup quarter-final replay against Aberdeen, manager Steven Gerrard has said: "We are talking about fan behaviour, stuff getting thrown on the pitch, people entering the pitch and striking players, which is a huge concern. For the image of the game, it's not right at all. "People around me will be in dialogue with stewards and security staff to make sure both sets of players and coaching staff are safe when we go out on the pitch to do our work. That's the only thing we can do. "But fans have to take responsibility and think before they do these type of things, because if it continues someone is going to get hurt and hurt badly, and no-one wants it to get to that stage."